Walmart will be underselling AT&T by $2! The most coveted gadget in the country is going on sale at the nation's largest retailer. 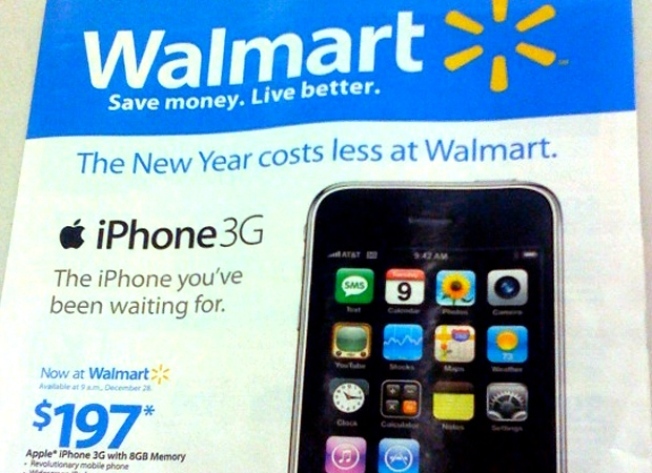 On Sunday, just in time to avoid the holiday shopping season, Walmart will begin selling Apple's iPhone. The 8-gigabyte iPhone 3G, which holds roughly 2,000 songs, will fetch $197, while the 16-gigabyte model will go for $297. The new partnership will allow Apple to expand their reach to approximately 2,500 Walmarts around the country. Best Buy sells the same iPhones for $10 less, but some Walmart stores will be matching local competitor's prices for a limited time. AT&T sells the phones for $199 and $299. There had been chatter in cyberspace that Apple would unveil a 4-gigabyte iPhone for sale at Walmart, but it was not to be.